July 11, 2006 will bring a close to Extended Support for Windows 98, Windows 98 Second Edition, and Windows ME as part of the Microsoft Life-cycle Policy. Microsoft will retire public and technical support along with security updates. What are your options you ask? Well you could buy Win Xp and a new computer that can run it, as they will both become obsolete when Microsoft Vista comes out in January or get Freespire and continue using your same computer. It's been three days since I've been playing around with the final release of Freespire 1.0. I find its a very well put together distro. Its the perfect distribution for those who have never tried Linux before and want to migrate from Windows. Having the Live CD functionality is a must for new users. The Live CD functionality of Freespire is very useful to first test the hardware that you plan to install Freespire on. In terms of installation the cd gives you several options including installing Freespire, running the the cd as a LiveCD of Freespire, and using the cd as a partitioning tool. Installation is no hard it took around 12 minutes on my machine and was guided very nicely by the GUI installer.Codec support is the most notable feature. Freespire 1.0 supports MP3, DVD, Windows Media, QuickTime, Flash, Java, ATI and nVidia drivers, Bitstream fonts,and much more. It is ideally suited for the non-technical computer user who would like to use GNU/Linux on their desktop or laptop, and have everything just work from the moment they turn on their computer. Also available is the Freespire 1.0 OSS Edition, a special version of Freespire that does not include any proprietary software. This version can be used by groups who want build upon Freespire, without any of the 3rd-party licensed components included in the cord OS. Freespire uses a customized KDE desktop GUI, the Firefox Web browser (rebranded as Lbrowser because of trademark issues ), Thunderbird for email, and includes such desktop standards as OpenOffice.org, and the Linspire-authored Lsongs for music. The default way to install and update software in Freespire is called CNR (Click and Run).CNR is not free. You can get a trial period for it by registering some details and if you like it you can pay an annual fee to have the privilege to use it. It's a great invention by Linspire which allows the user to browse catalogs of software and install them by simply clicking on them. 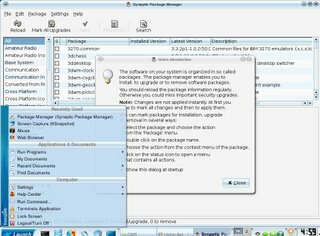 Freespire is a Debian-based distribution. 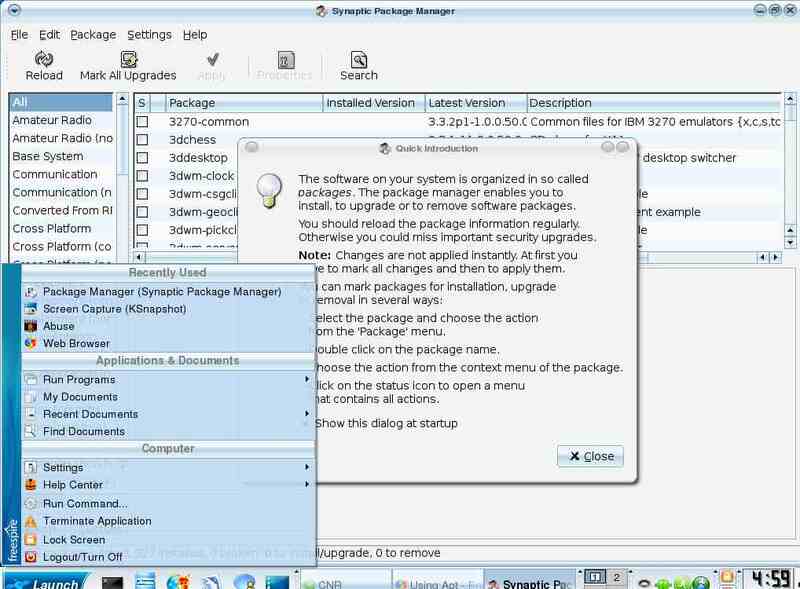 That means any DEB-compliant installer program, such as apt-get or Synaptic, will work. Things like synaptic, adept or aptitude are not installed by default, by they are easily added through the use of apt-get. 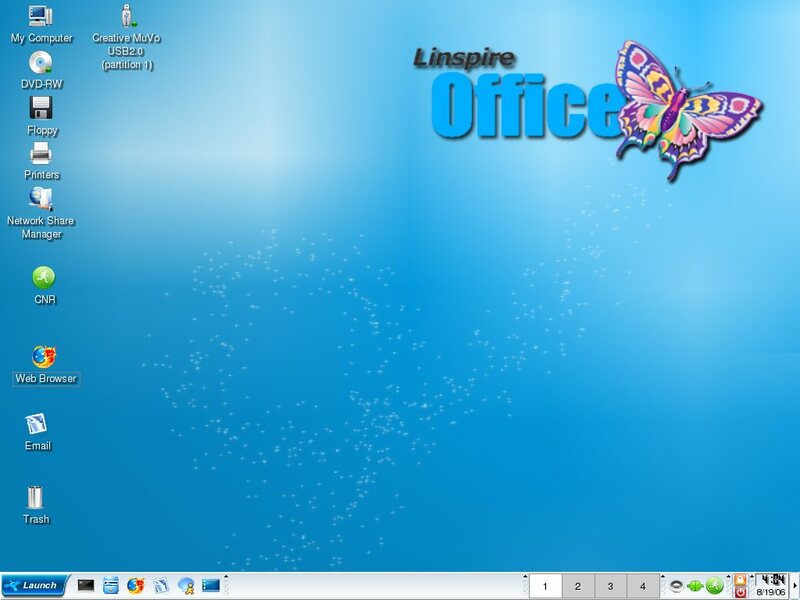 If you're happy with with Linspire 5.0 or 5.1, there probably isn't any reason to switch. Besides most of whats in Freespire 1.0 and 1.1 will find their way into the next version, Linspire 6.0.